When you have a flat roof on your home or business, it is important to take the necessary steps to properly protect it. If the integrity of your building’s roof is compromised, it can lead to a whole host of other problems inside and out. The right type of roof coating, when properly applied, can go a long way in protecting your building from leaks, reducing the workload of your HVAC system, and save you money. Siliconized roof coatings have been a popular option for years now, but there are still a good many people who are unaware exactly what these roof coatings do and how they can benefit their home. Here is a short list of 3 ways your home can benefit from having a siliconized coating installed on the roof of your home or business. Since silicone roof coatings generally have a higher solid content than that of acrylics or other cheaper coating, they can usually be applied thicker and in one solid coat without reducing its effectiveness or the quality of the application. This can save you money on labor costs by reducing the amount of time the installers need to spend up on your roof. The ability to apply this coating in a greater thickness means that you can also have minor slopes corrected and reduce the number of areas where water will be able to pool on your rooftop. Additionally, where standing water can make acrylic coatings start to liquefy and separate from the roof, where this actually helps cure siliconized coatings and makes them more resistant to moisture. 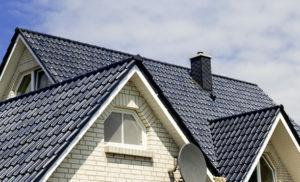 Because of its unique scientific formula, a siliconized roof is able to moisture cure. This means that your siliconized roof coating basically forms a seal between your roof and any standing water on top. Silicon coatings can maintain their adhesion to your roof and remain leak-free even with standing water on top. Siliconized roof coatings are also designed to be longer lasting than acrylics, so they will not begin to flake away and deteriorate. The beating sun also has a tendency to dry out and crack most acrylic roof coatings, but silicone membranes were originally designed to combat this particular flaw, so you can count on your siliconized roof coating to stand up to the heat.. This can be extremely important during the scorching summer months here around Phoenix. Applying a siliconized coating to your roof is easier than installing almost any other roofing membrane for a number of different reasons. Not only do silicone coatings cure faster, but they are moisture cured products, meaning they can still cure even in rainy or humid conditions, and they can cure fully in either hot or cold temperatures. This means there is no wrong time of year to have your siliconized roof coating installed. In most cases, applying a siliconized roof doesn’t even require the use of a primer except in certain rare circumstances. It can be applied directly to most roof surfaces with just a simple power washing.